For an alternative take on lasagna, instead of going the traditional beef-tomato-ricotta route, I've developed a dish made with ground turkey, roasted butternut squash, sage and goat cheese. It's a wonderful combination of flavors. I wondered recently if it could also work as a meatloaf. 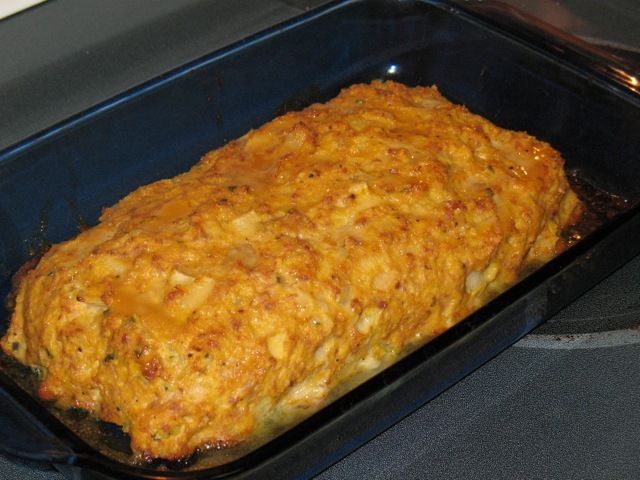 The answer is "yes definitely," as this turkey-butternut squash meatloaf was tasty, balancing meaty and sweet flavors with a nice crust and moist interior. If the flavors of this dish recall Thanksgiving, then it's appropriate that the bread crumbs I used were some leftover bread cubes from Thanksgiving that I ground up with a food processor. Although the meatloaf is baked, I first roasted the squash separately so that it would caramelize and add those nice flavors. I used the technique from the parsnip cake of roasting the squash tossed with olive oil and wrapped in foil to reduce moisture loss. I used two eggs to bind together the loaf and, since the squash contains a good amount of moisture, no additional liquid was needed. I had thought about putting the glaze on the raw loaf, but it was so moist that I was afraid it would just soak in. So I baked it first to let the crust form and added the glaze about 2/3 of the way through baking. Again, I steered clear of tomatoes, opting for honey and mustard. 1. Preheat oven to 400 F. Line a baking sheet with aluminum foil and spray with olive oil. Cut large pieces of squash so that all pieces are about an inch cubed. 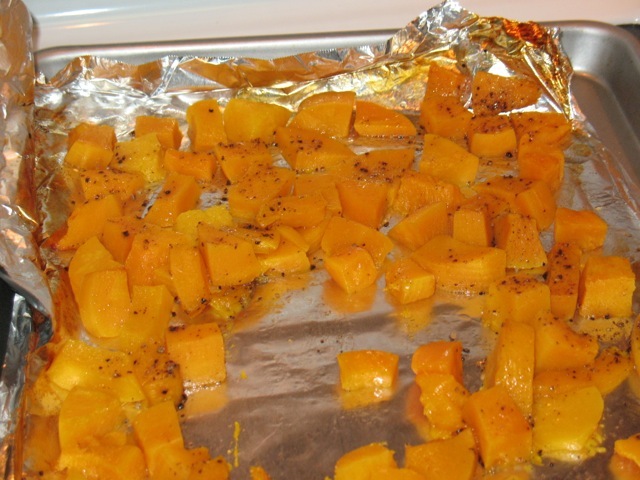 Scatter squash across lined baking sheet and spray all pieces with olive oil. Season with salt and pepper. Cover with a second piece of aluminum foil and roast for 40 minutes. Puree cooked squash in a food processor. Adjust oven temperature to 350 F.
2. Heat 1 tbsp. olive oil in a large frying pan over medium heat. Saute onion and garlic until softened, about 10 minutes. Stir in chopped sage, season with salt and pepper, turn off heat and set pan aside. 3. In a large bowl, combine squash puree, cooked onion mixture, ground turkey, bread crumbs and eggs. Spray a 9X13 baking dish with olive oil. 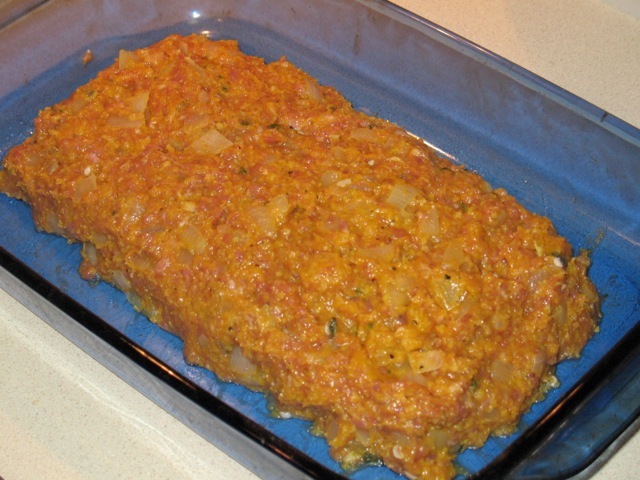 Place meatloaf mixture in baking dish and form a loaf with with your hands about 5-6 inches across and 3 inches high. 4. Bake meatloaf in oven for about 40-45 minutes. 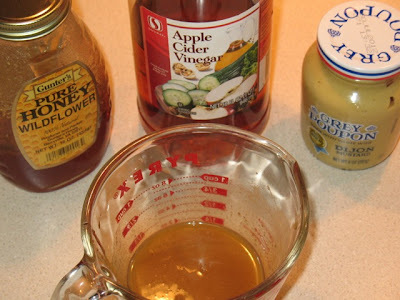 While baking, combine honey, cider vinegar and mustard to form glaze. When meat loaf has browned a bit on the outside, remove from oven and brush all over with the glaze. Return loaf to oven and continue baking another 20-30 minutes until done (since this is turkey, it cooks a little longer than a beef-based meatloaf. I cooked mine to an internal temperature of 170 F). 5. Remove meatloaf from oven and let rest about 10 minutes. Serve sliced into 1-inch thick pieces (makes about 8-10 slices). 2. Remove core and cut cauliflower into florets. Place in a large bowl and toss with olive oil, salt and pepper. 3. Line baking sheet with aluminum foil. 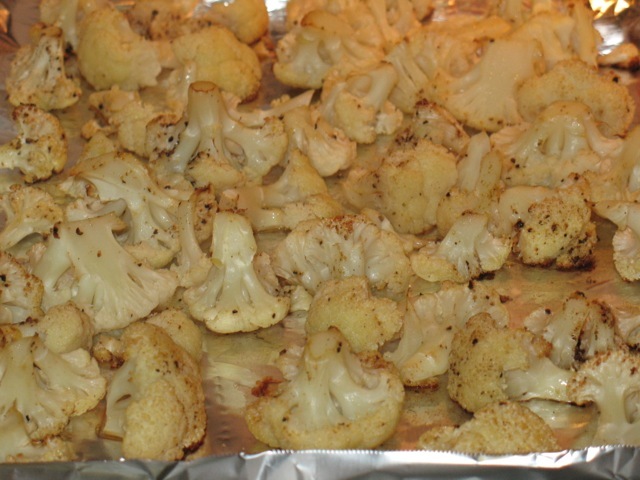 Scatter cauliflower florets across lined baking sheet. Cover with a second piece of foil. Roast in oven about 40-45 minutes. Remove top piece of foil. Continue roasting another 10-20 minutes until florets are nicely browned on the edges. 1. Wash and thoroughly dry kale. Remove stems, roll up leaves, and slice across rolled log about 3/4-inch thick pieces. 2. Heat olive oil over medium-high heat in a large frying pan. 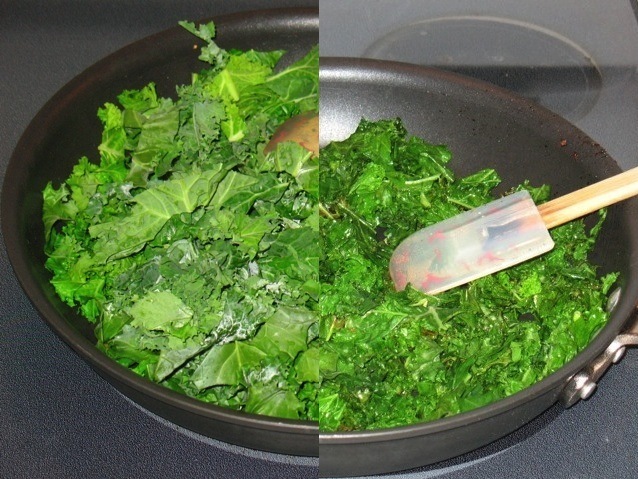 When oil is hot, add kale to pan. Saute until wilted and browned. Season with seasoned salt, pepper and vinegar. 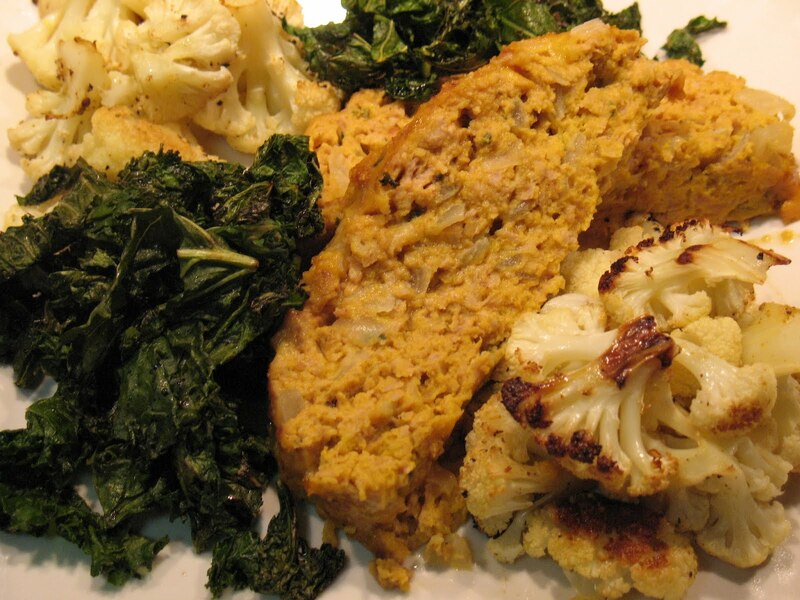 This was good, although your traditional meatloaf remains one of my favorites. I really liked what you did with the cauliflower here. ... And is this where those breadcrumbs went? They sat atop the refrigerator for months. Thanks. The cauliflower couldn't be simpler. Roasting does great things to so many vegetables, requiring little else to augment their flavor. 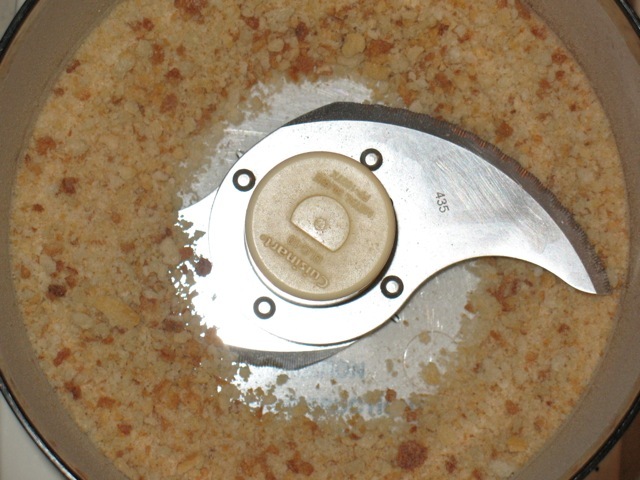 I'm glad I finally found a good use for those breadcrumbs!